Do you want more sales and wonder why they’re not coming in? There’s a chance you might be making your customers work too hard! 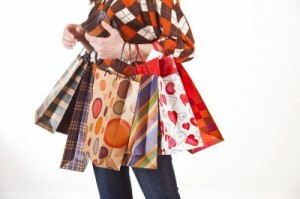 It’s no secret that people who are out shopping don’t want to work hard at finding things. But are you doing all that you can to make things easy-as-can-be for your customers so that your sales will increase? Follow these simple tips to make buying so easy for your customers that they won’t be able to resist! 1. Keep your products at eye-level or lower. People don’t like to look up more than they have to (or bend too far over, for that matter). It might sound silly, but watch your behavior the next time you’re browsing through a store or booth, we bet you’ll find yourself looking at the lower items more than the higher ones! 2. Display products in such a way that customers can try them on. If a customer can easily try a bracelet or ring on, they’re more likely to buy it because they become familiar with and attached to it as they wear it. This also cuts out the step of, “Hmm, would that bracelet look good on me? Would it match my style?” When your customers can see themselves in your products, they won’t have to do any guesswork about whether or not they’ll like it. Design your displays so that customers feel comfortable enough to try something on if they like it, not as if they’re going to mess up your display if they touch something. 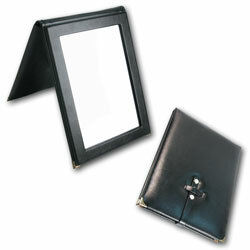 A portable folding mirror makes it easy for customers to see how your products look on them. Make it easy for them to fall in love with your jewelry! 3. Pair matching or complementary products together. Again, don’t make your customers have to look for matching earrings and necklaces, because they might not take that extra step. But if you do the work for them and display these items together, or suggest them while they are browsing, you’re more likely to sell two or three items instead of one. Make it easy for customers by giving them suggestions for which products go well together. Jewelry combination stands make this easy! 4. If you’re selling beads or gems, do your customers have to think about how to use your products, or are there examples in your display setup? 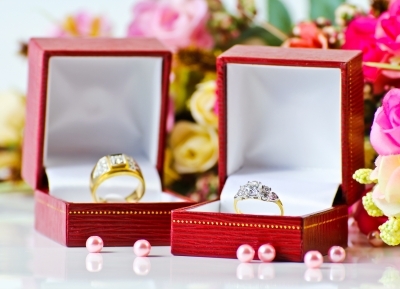 If you’re selling gems, show customers how they’ll look when set in a ring or necklace. If you’re selling beads, show customers example of bracelets, necklaces, and earrings that can be made with your beads! This will help them envision the things they will be able to create with your product and make them want it. What things have you found that make for smooth sales? …have varied display heights? You want your customers’ eyes to naturally move along your entire display so that they see all of what you have to offer, and you can make this possible by not having all of your displays be exactly the same height. Here’s a great example. …have a focal point in your display? A clear focal point is vital to a successful display. This doesn’t mean you have all the same type of jewelry or product; it simply means that you have key spot in your display and build everything around that. This is the spot that will catch peoples’ eyes before they scan through the rest of your display. If there is no focal point, it will confuse customers and could result in fewer sales. 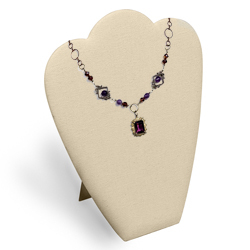 …choose display colors that enhance or distract from your jewelry? Color choice is very important. If you place white jewelry on a white background, it isn’t going to stand out like white jewelry on a background. 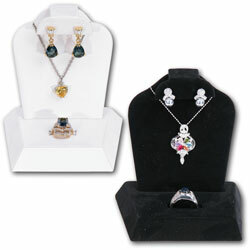 Similarly, if you have bright jewelry and bright displays, the effect could be overwhelming for your customers. Notice how the beige background is light enough to make the necklace pop without taking away from the jewelry? …frequently change the displays in your store? If you have repeat customers and they always see exactly the same thing in your store window or display cases, they’ll quickly lose interest. Keep things fresh and new by changing your displays at least 6 times per year (about every other month).